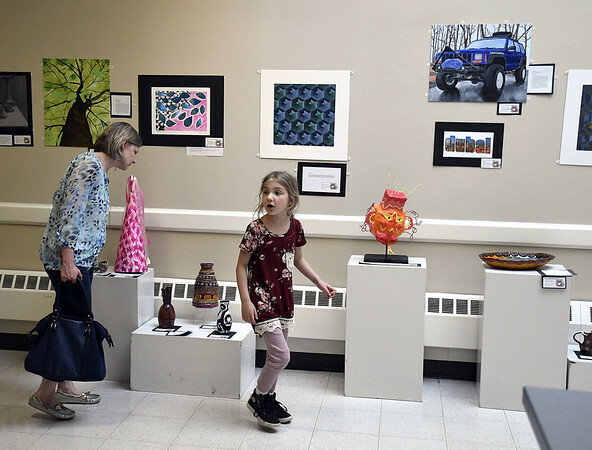 BRISTOL – Local youth proudly displayed their artistic creations and showed them to supportive family members Tuesday at the “Art Speaks” Community Art Show. 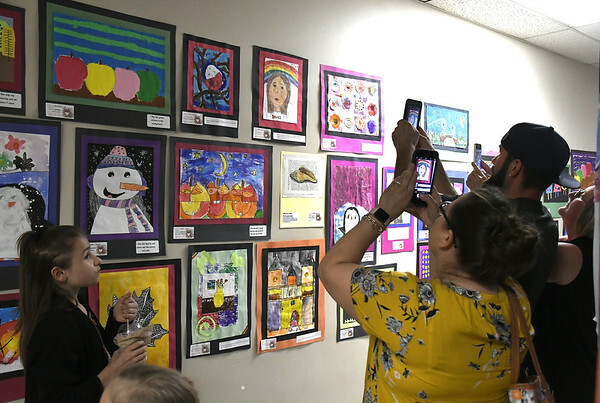 The art show, which featured paintings, sketches, collages, sculptures and more, was held at Imagine Nation, A Museum Early Learning Center and the Board of Education building across the street. 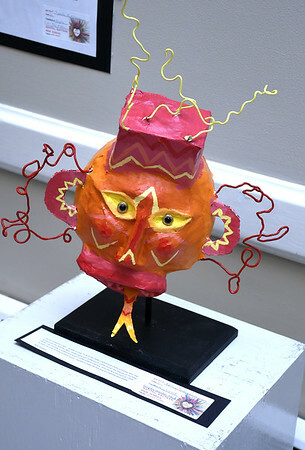 The museum housed the varied works of preschoolers, whose curriculum at the Early Learning Center taught children about the styles of several famous artists. The Board of Education building, meanwhile, contained the works of students from kindergarten to senior year of high school. At Imagine Nation, Emily Petrillo of Blick Art Materials helped children who stop by make a tree using cutout paper hands and dabs of paint for leaves. Christy Rushlane came to the art show at Imagine Nation with her three year old son Anthonee who proudly pointed out a flower he made in the style of Georgia O’Keeffe and grinned from ear to ear as his mother and grandmother, Tammy Gennett, took pictures. Jade Douglas admired flowers drawn by her four year old son Calrissian. On the second floor of Imagine Nation, at the art studio, Kim Craig admired a piece of “glass art” made with painted water bottles in the style of Dale Chihuly by her daughters Samatha, 3, and Allison, 8. “It’s really cool to see how they put all of these pieces together in one location,” said Rushlane. Jamie Morin stopped by the Board of Education building with his 10 year old daughter Angelina to see her works. “I drew autumn leaves falling with a blustery wind blowing around,” said Angelina. Morin noted that his daughter is “very artistic” and recently participated in the Invention Convention as well. Sarah Thibodeau also came to the Board of Education Building to check out the works of her two children Jarred, 5, and Dominic, 8. “I really like drawing,” said Dominic, who showed off his picture of a snow plow driving down the street during the winter. “I love the shiny nose,” said Thibodeau as she admired Jared’s picture of Rudolph the Red Nosed Reindeer. Kamali, who declined to give his last name, his wife Kalecia and their children Isiah, 9, Jasiah, 7, Mya, 4, and Gia, 2, were also at the Board of Education building admiring a kettle drum piece that Isiah made with magazine clippings. Posted in The Bristol Press, Arts, Bristol on Tuesday, 1 May 2018 21:32. Updated: Tuesday, 1 May 2018 21:34.